If a high-speed train runs at 185 mph through small urbanized areas, it is possible that some animals will be surprised in their path, including magpies, pigeons, crows and buzzards. These collisions have not been scientifically analyzed or quantified to date. A new study now reports obtaining the first estimates in Spain. The development of high-speed rail poses new ecological challenges. The thousands of kilometers of railways with trains operating at speeds of more than 155 mph can generate unwanted effects, such as the mortality of birds, a fact that until now had not been analyzed or quantified. A study published in the journal Frontiers in Ecology and Evolution, has developed a new methodology to study the impact of high-speed trains on birds. For this purpose, a video system was installed in the cabins of locomotives during more than 8,700 miles of circulation at speeds of 155-185 mph. "This has allowed us to obtain the first ever published estimate of bird mortality by high-speed trains and better understand the behaviors that condition the crash," says Juan Malo, author of the study and researcher at the Autonomous University of Madrid. The researchers recorded 1,090 sightings of birds in front of a train cabin to better understand which ones are more at risk and why. They obtained much more precise data than was possible a few years ago. Specifically, they calculated that a high-speed rail underway crosses birds in the vicinity of its frontal approximately every nine miles of travel, and runs over a bird every 225 miles. "On the Madrid-Levante line, on which the work has been carried out, some 60 birds per kilometer between Madrid and Motilla del Palancar, and 26 birds per kilometer on the stretch between Motilla del Palancar and Albacete, can be run over every year," Malo says. According to the report, about a third of the rail crossings of the road occur below catenaries, which corresponds to birds that risk being run over. "In addition, more than 25 percent of the crossings in front of the train have birds that were perched on the ground, roads or cables of the infrastructure just before the train passes, as protagonists," says the researcher. 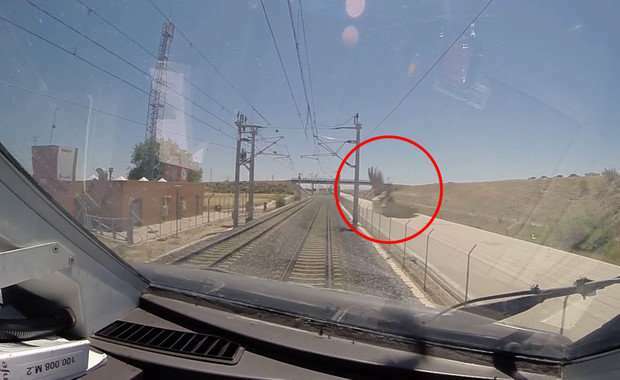 The video record also confirms that the birds generally react at a distance of 200 to 445 feet of the train, so the train´s speed leaves them little time to escape. "As a result, a small fraction of the birds that can be seen from the front of a train end up dying," he adds. To reduce collisions with birds, the research team will seek methods to repel birds from infrastructure elements, and develop systems that decrease the frequency with which animals fly through the risk areas. The latter is a specific objective of the LIFE + Zero Impact project. "The published data will serve to inform about the environmental impact assessments that are made in the future on the railway tracks to be built, and to guide the design of corrective measures," concludes Malo.